We define a "safe money place" as one where your principal is protected from loss as long as you follow the initial guidelines, and if you do decide to take your money and leave, you know pretty much what leaving early will cost. 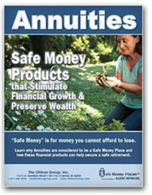 Safe Money Places is a family owned and operated business. We have been involved in the financial services industry for over 43 years with various backgrounds and specialties. We wanted create a website where pre-retirees and retirees can get educational information about all "safe money places". There are many products out there, and it can be overwhelming and difficult to choose the right product solution to meet your financial goals. Our mission for this website is to help people navigate the retirement landscape and make it easier to make an educated decision regarding their retirement. Are you ready for safe and guaranteed return son your money? If so, we'll show you which income sources are considered "safe" for your money that only offer guarantees with no risk of losing principal. Many pre-retirees and retirees are concerned that their 401Ks, IRAs, Social Security, and savings won't provide enough income. The Personal Pension Plan strategy "fills income the gap". Wealth Transfer is a financial concept that'll help you preserve your nest egg and distribute it in one of the most tax efficient ways possible. This helps your heirs avoid the "Tax Time Bomb." To better understand why certain products are considered "safe money places", you need to learn about the "safety" banks, credit unions, and insurance companies provide with their products. The math formulas of saving may seem intimidating, but nothing that follows is more difficult than some of the basic algebra concepts you've already know. Trust us, these concepts are easier to understand today.